Now that Solaris 11.1 now comes with cups v1.4.5 I thought I would replace our old Solaris 10 lpd server with a cups set up. The printer server is used by many clients, MacOS, Windows and Solaris. Note: Solaris SRU 11.1.8.4.0 fixed a few problems with Cups. A normal Solaris zone is required and nothing special here. Restart the services and the URL should work. Now you can add a printer. The GUI is straight forward so it is just a matter of finding the printer interfaces. 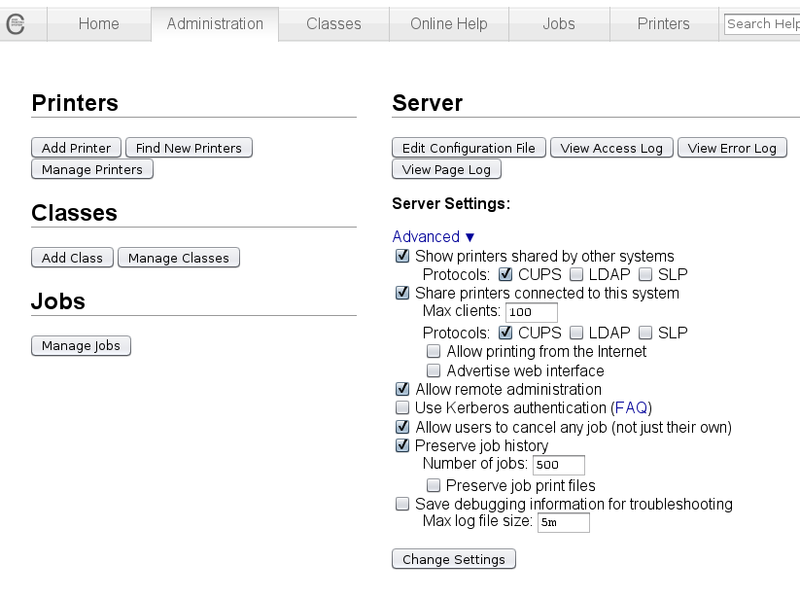 Also, alter the some of the server administration options. Here are the command line way of doing it. We have a lot of HP LaserJet P4515x printer and I am using a PS PPD file that came with print/filter/hplip since I had problems with the cups (hpcups) software. # lpadmin -p cork -L"Printer Room" -D"HP Laserjet 4515"
Test that your printer works. I had a lot of problems with Windows 7 x64 and printers drivers, but I got it to all work with using the CUPS driver above and the "HP Universal Driver PS"
C:\Windows\SysWOW64\Rundll32.exe printui.dll,PrintUIEntry /ga /x /n "cork" /if /r "http://printsrv:631/printers/cork" /m "HP Universal Printing PS" /h x64 /b "cork"
After you have set any default options using the Printer Wizard on Windows 7 i.e. Duplex, Location and other features you can save it for future deployment. C:\Windows\SysWOW64\Rundll32.exe printui.dll,PrintUIEntry /Ss /n "cork" /a "C:\Temp\setcork.dat"
That it! Hope it helps. Well this method is bit complicated but very effective and efficient. Yes - there are still computers here, sadly. I now tell people that I used to be a pig farmer, it's easier. Now using Linux Mint - it was time to leave the capitalist proprietary software behind. Sorry that you're still working - it's not good for your health, you know! Thanks so much for your blog. I am just configuring a couple of Solaris 11 servers, having been out to pasture with Linux for maybe the last ten years - since my SunOS days. Really delighted to come across your blog. Just reading through this, and about to have a go - but, please excuse my ignorance - why is creating a zone necessary for this process? I understood that they were virtual OS environments? Sorry for the delay. Thanks for your comments and the short answer is you don't require a zone and you also right a zone is a VM. The reason why I and many uses zones is you separate the application from other programs for security and/or software versions. For example. You can update the software versions in one zone without effecting other applications. Don't forget a Solaris Zone has no over heads. Wow. My gosh. I have just learned about and set up my first zone. I am absolutely blown away. It's genius stuff! Thank you for sharing this. Zones are great tool and I think the basic rule is to put all applications in a zone. Even every major application in its own zone, since it provides an isolated and secure environment. Now with Solaris 11.2 and kernel zones you can have different versions of the OS so you can upgrade the version independently of the global zone.